Take a stroll on the Dakota Rail Trail! 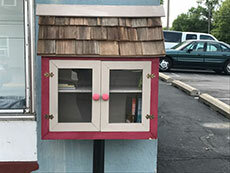 "Take A Book - Leave A Book"
The new FREE little library is located on the corner of Kennedy Memorial Drive and Main Street (Co. Rd. 92). The little library is a project of the St. Boni Area Community Development Group.